All Star Cheer Teams move at a fast pace, with high energy and need all the right apparel to help them be the best they can be for their team, while having fun and radiating confidence! Custom all star cheer team jackets from Crystallized Couture is the best option for making your cheer team to sparkle and outshine your competition with rhinestones, sequin’s or glitter. Is your team looking for new custom all star cheer jackets? Crystallized Couture will definitely be the partnership you need for ALL your customize cheer apparel must haves. We love working with cheer teams in designing their warm-ups and jackets to fit their personality. From picking out the right jacket and color scheme and working together on getting the design and and look right for your team members; we work with you throughout the entire process in order to get your custom jackets perfect. You will find that our product is of superb quality that will have you and your team looking fabulous season after season. Another great asset you receive when working with Crystallized couture, is the ability to get sample sizes for your team before finalizing your order. Athletic clothing that does not fit well, whether to big or to small, is not flattering. We want to make sure your team is the best of the best. We offer a variety of brand names that include Augusta, Nike, Adidas, Chasse, and so much more. If you do not see exactly what you are looking for, let us know we would be happy to find your perfect style. 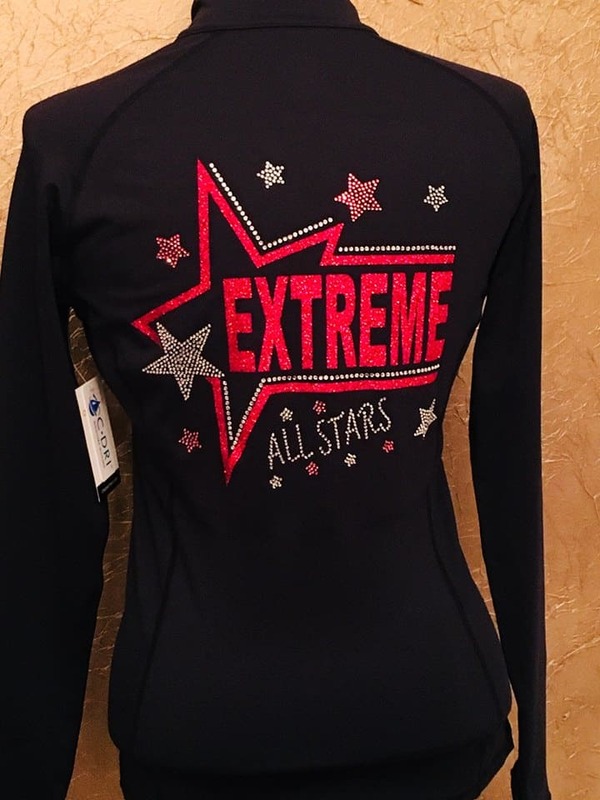 Crystallized Couture specializes in custom rhinestone apparel & can design custom cheer team jackets & warm-ups with your team logo & personalized with the cheer team members name or even nickname. You have the ability to approve all designs before going to print & you will find that the product you get from us is of better quality than what you have bought before, and our pricing in most cases is less than what you have paid from our competitors. If you are looking for jackets for your varsity team, you can click on that link to get more information and see some examples. 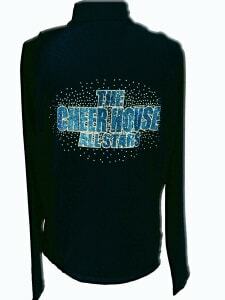 Beautiful all star cheer team jackets by Crystallized Couture for The Cheer House All-Stars. We can find the right all star cheer team jackets and warm-ups for your team to meet your aesthetic needs as well as budget. We licensed with many cheer apparel distributors to get the perfect warm-up for you. We can also make a variety of cheer shirts that we can help your team create and distribute to members and their moms. Ask about discounts for your cheer jackets and warm-ups of 15 or more. We love cheer teams and want to help them as much as possible, as well as partner with them for many years to come. By giving cheer teams money back right away, they are able to invest into the team further for other apparel, competitions, or camps to help the team get better. Call or Email Nicolette today to start customizing your All Star Team Jackets with rhinestones, glitter, or sequins.